This area was redistricted recently and it now borders Bloor Street to the North, Islington Avenue to the west, The Gardiner to the South and Humber River to the East. During the 2000s, the Queensway has been subject to new Condominium development particularly in the vicinity of the Humber River. The Hive, Next across from the Queensway Cineplex Theatres and VIP are some of the Condos in the area. When the Mega Cineplex moved so did many of the popular Chain Restaurants, Milestones, Kelseys, Montanas to name a few. We love the Pie Commission a up and coming savoury and sweet pie take-out eatery for those nights you dont have enough time to cook . The Queensway is the western extension of Queen Street (Toronto), after it merges with King Street near Roncesvalles Avenue in Toronto, Canada. In contrast to Queen Street which explifies the urban nature of Toronto's downtown, the Queensway is more suburban in nature. South Queensway has added many townhomes complexes freeholds and condo types. 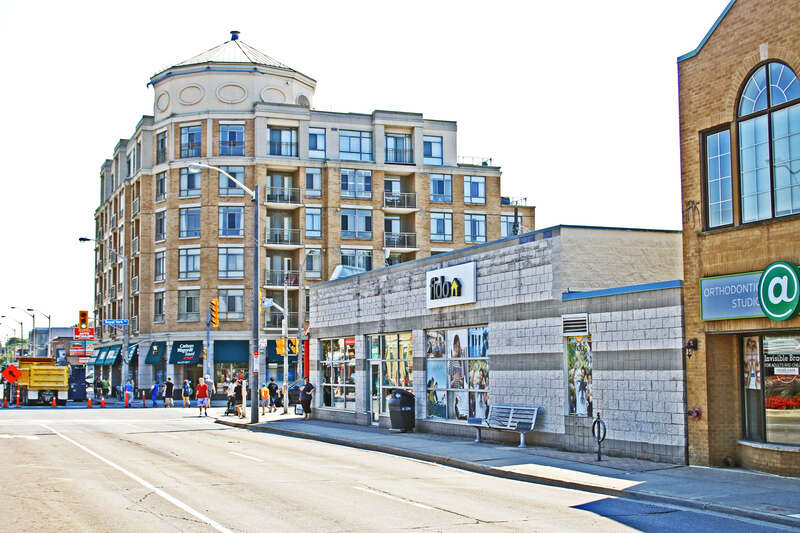 Find homes for sale in The Queensway at Etobicokeforsale.com! The redistricting of the section east where Roncesvalles and the Humber River was rebuilt in the 1950s, as was the construction of the Gardiner Expressway and Lake Shore Boulevard is now in the High Park Swansea W01 district. An interesting tidbit of info is the raising of the former Sunnyside Amusement Park, whose Ferris Wheel eventually was moved to Disney Land in Anaheim, near Los Angeles, California, USA. This happened in the 50's probably when Toms Dairy Freeze was conceived but didnt actually appear till 1969. Many new Condo projects are and have been built since 2000 along The Queensway to go with the new Commercial Business area with new businesses like Costco, Great Lakes Brewery and of course the Pie Commission. Etobicoke School of the Arts has brought talented children from all over the City to Etobicoke to develop their craft. Find their link on the school page and it will take you to their site for all the specifics to enroll your child. Our closest Remax office to Norseman Stonegate is at 4242 Dundas Street West at the Brunos Plaza east of Royal York Rd. Come and meet with us there!